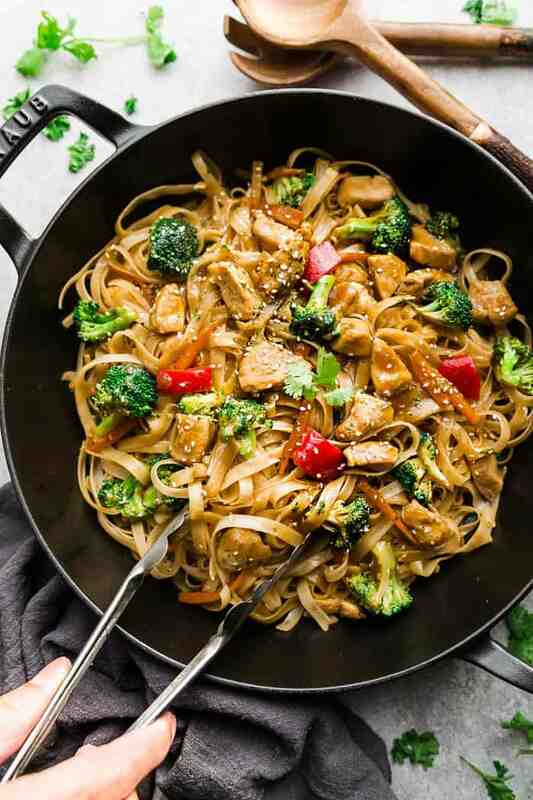 Asian Sesame Chicken Noodles – a one pot 30 minute meal perfect to curb those takeout cravings. 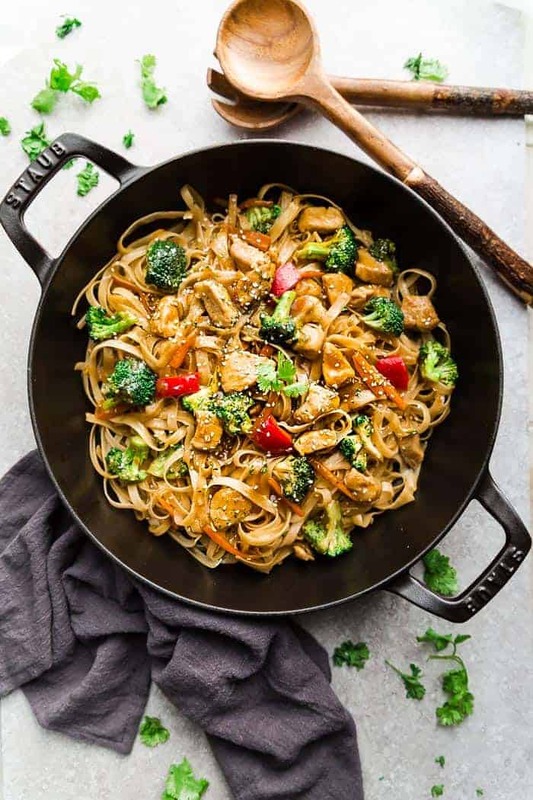 Made with chicken, veggies, gluten free rice noodles and a delicious savory Asian-inspired sauce. Easy one pot meals are always a favorite for busy weeknights. Especially when noodles are involved. Since Lunar (Chinese) New Year is coming up soon, we couldn’t let this special occasion go without sharing a new noodle dish. These Asian Sesame Chicken Noodles are full of flavor and come together in just 30 minutes. And the best part? These delicious noodles have that same sweet and sticky sauce that everyone loves about P.F. Chang’s Mongolian Beef. You can satisfy that takeout craving without leaving your house. Plus, I use gluten free rice noodles and added lots of chopped vegetables so you can still keep those healthy New Year’s resolution goals. 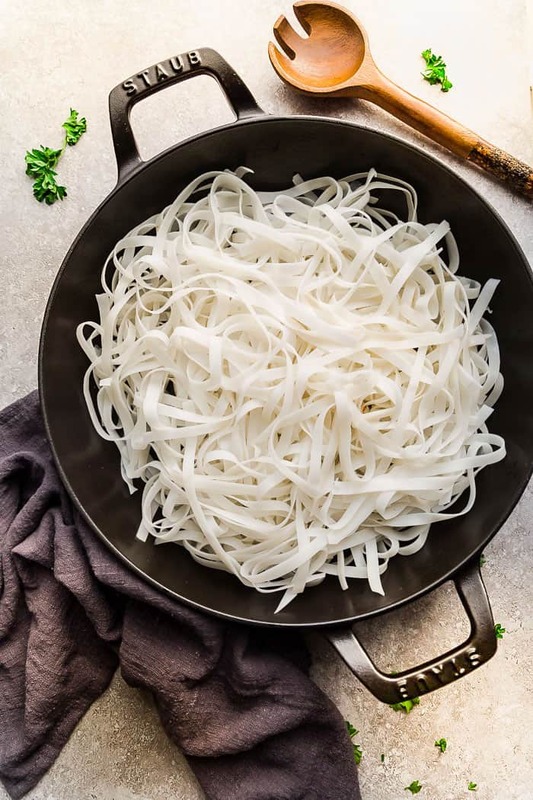 To keep these lower carb, you can even use these Shirataki Noodles that I am obsessed with. Easier, healthier and better than takeout! Start off by soaking the rice noodles in a big bowl of hot water. The great thing about rice noodles is that they are gluten free and are ready in about 8 minutes. Be sure to grab the ones that you use for Pad Thai or Pho – they are about 1/4″ thick. You can usually find them in the Asian aisle at most large grocery stores. To make the sweet and sticky sauce, you’re going to whisk together some low sodium soy sauce, garlic, ginger, hoisin sauce, brown sugar and a little bit of cornstarch to thicken it up. After you brown the chicken, transfer to a plate. Saute the vegetables and cook until they are just crisp tender. Add the sauce, chicken and noodles back to the pan and toss to coat well. Serve hot with a sprinkle of sesame seeds and chopped green onions, if desired. Can I use another type of noodles? Yes, this recipe is really flexible so feel free to use any other (preferably 1/4″ thickness) noodles of your choice. Lo mein, egg noodles or even fettuccine noodles would be delicious here as well. 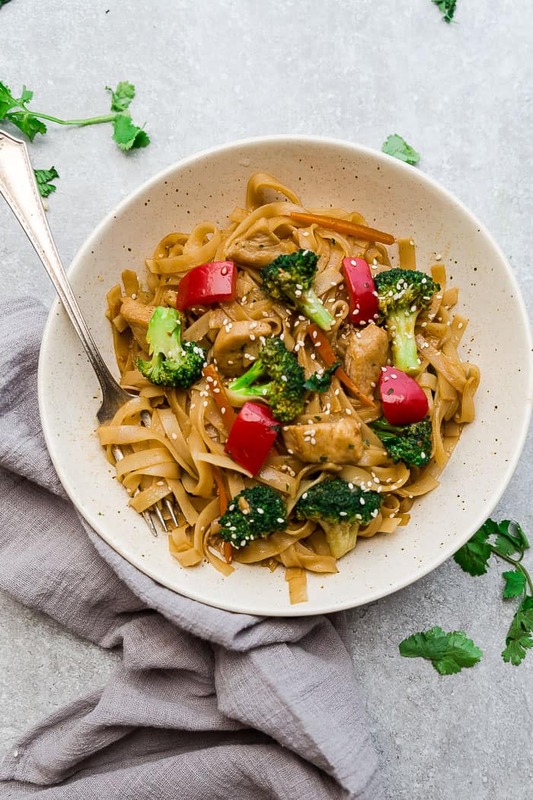 Asian Sesame Chicken Noodles - a one pot 30 minute meal perfect to curb those takeout cravings. 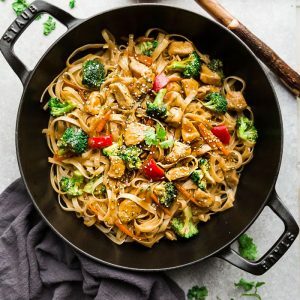 Made with chicken, veggies, gluten free rice noodles and a delicious savory Asian-inspired sauce. Season chicken with salt, black pepper, and 1/2 teaspoon sesame oil. Set aside. Heat a large wok or skillet over medium-high heat. Add 1 1/2 tablespoons olive oil and saute chicken until cooked through, about 4-5 minutes. Transfer to a plate. Return pan to heat and add remaining olive oil. Add the garlic, ginger, and broccoli. Cook until the vegetables are just crisp tender, about 2-3 minutes. Meanwhile, whisk together the coconut aminos, fish sauce, sweetener, remaining 1/2 teaspoon sesame oil, xanthan gum (if using) and water. Stir into the pan along with the cooked chicken and prepared noodles. Allow sauce to bubble and thicken up and toss to coat well. Adjust seasonings with salt and pepper as needed plus chili flakes or Sriracha if desired. Serve hot and garnish with sesame seeds, green onions, and carrots, if desired. this was super delish.THE ONLY CHANGE WAS THAT I COOKED EVERYTHING IN SESAME OIL — FANTASTIC AND QUICK MEAL. eASY TO DOUBLE AND HAVE FOR LEFT OVERS.